The AIA Jacksonville Design and Honor Awards Program is the method by which the Jacksonville architectural profession honors members, advocates, and industry participants to encourage excellence in architecture, to elevate public consciousness of good planning and design and to recognize those whose work or advocacy enriches the built environment.­ Design and Honor Awards are bestowed upon members and participants who have contributed to the advancement of architecture, urban planning, art and craftsmanship. The Linda Mack Award is awarded in memory of Linda Mack to an individual within the architectural community whose outstanding drawing ability, rendering talent or artistic endeavors enhances the promotion of architecture to the community. This includes works in computer graphics, computer imaging, and 3-D modeling. To recognize an individual citizen, a community organization, a governmental agency or a local company or corporation who has made a significant effort contributing to the advancement of architecture, the arts or the environment within the community. The Mellen C. Greeley Craftsmanship Award is for work demonstrating superior quality of workmanship in the building construction industry. Any individual, team, subcontractor or general contractor who directly executed or was responsible for any phase of building construction may be nominated. Work performed entirely or primarily in a Partnership may also be nominated. Work shall be located within the Duval, Nassau, St. Johns or Clay Counties, and have been completed during the five previous calendar years. This award is in memory of John W. Dyal, this award shall be given annually to recognize an architect whose leadership and service has been a direct benefit to the profession or community. The nominee’s leadership and service must demonstrate quality outcomes in works of art, programs or civic influences over an extended time. 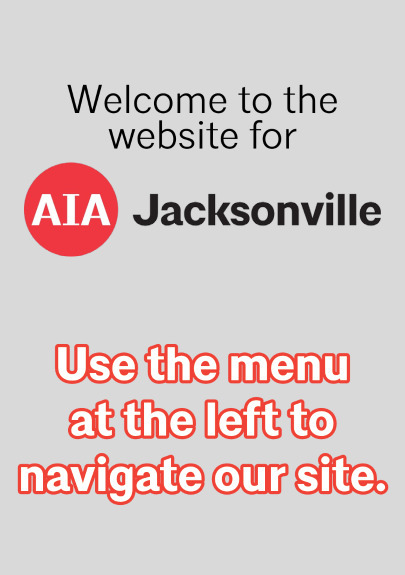 Any member of AIA Jacksonville is eligible for this award. Henry John Klutho was one of Jacksonville’s most talented and prolific Architects. During a career that spanned over six decades, he created numerous works of consistent high quality that, to this day, continue to be a significant part of the City’s architectural fabric. In the spirit of this accomplishment, this award is given in recognition of life-long commitment to design excellence, advancement of the profession and the enhancement of the built environment. To recognize works of architecture, 25 years or more after their completion, in which the function, aesthetic statement and execution of the project can be reassessed. The project must remain substantially in its original form, be in good condition and still house its original program. Change in use is permitted if it has not basically altered the original intent of the design. Click HERE for Design Awards information.